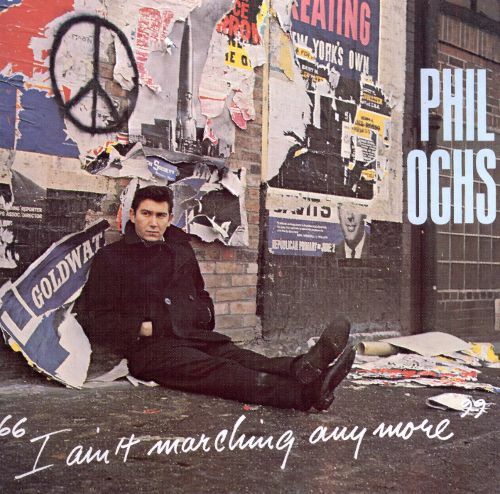 Today is the birthday (1940) of Philip David “Phil” Ochs, a US protest singer (or, as he preferred, a topical singer) and songwriter who was known for his sharp wit, sardonic humor, earnest humanism, political activism, insightful and alliterative lyrics, and distinctive voice. He wrote hundreds of songs in the 1960s and 1970s and released eight albums. Ochs is not remembered much these days and was never as important in the UK where I was living through most of the Vietnam War as he was in the US, where he was definitely a major voice for protest. 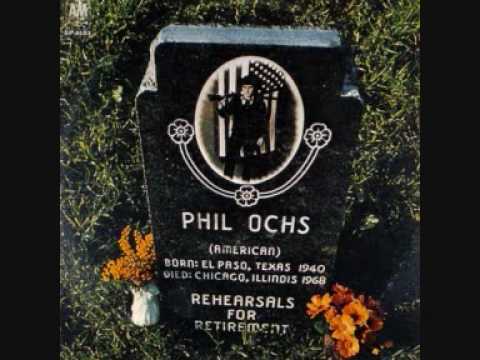 People like Bob Dylan and Joan Baez captured (and continue to capture) more of the spotlight, but for my money Ochs was a more heartfelt voice of protest, and – on this day at least – he deserves not to be forgotten. Ochs performed at many political events during the 1960s counterculture era, including anti-Vietnam War and civil rights rallies, student events, and organized labor events over the course of his career, in addition to many concert appearances at such venues as New York City’s Town Hall and Carnegie Hall. Politically, Ochs described himself as a “left social democrat” who became an “early revolutionary” after the protests at the 1968 Democratic National Convention in Chicago led to a police riot. I’ll begin with, arguably, his best known protest song. That is, if it is remembered at all. Where is this voice now? 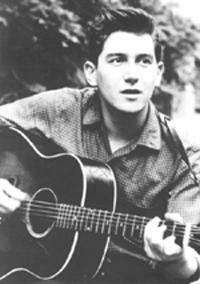 Phil Ochs was born in El Paso, Texas, to Jacob “Jack” Ochs, a physician who was born in New York and Gertrude Phin Ochs, who was born in Scotland. Jack, drafted into the army, was sent overseas near the end of World War II, where he treated soldiers at the Battle of the Bulge. His war experiences affected his mental health and he received an honorable medical discharge in November 1945. Suffering from bipolar disorder and depression on his return home, Jack was unable to establish a successful medical practice and instead worked at a series of hospitals around the country. As a result, the Ochs family moved frequently: to Far Rockaway, New York, when Ochs was a teenager; then to Perrysburg in western New York, where he first studied music; and then to Columbus, Ohio. As a teenager, Ochs was recognized as a talented clarinet player; in an evaluation, one music instructor wrote: “You have exceptional musical feeling and the ability to transfer it on your instrument is abundant.” His musical skills led him to play clarinet with the orchestra at the Capital University Conservatory of Music in Ohio, where he rose to the status of principal soloist before he was 16. Although Ochs played classical music, he was interested in all manner of styles from Buddy Holly and Elvis Presley to Hank Williams and Johnny Cash. He also developed an interest in movie rebels, including Marlon Brando and James Dean. Somewhere during the course of those fifteen days I decided to become a writer. My primary thought was journalism … so in a flash I decided — I’ll be a writer and a major in journalism. Ochs returned to Ohio State to study journalism and developed an interest in politics, with a particular interest in the Cuban Revolution of 1959. At Ohio State he met Jim Glover, a fellow student who was a devotee of what was called “folk” music. [Hint: Dylan, Baez, Seeger et al are not folk singers]. Glover introduced Ochs to the music of Pete Seeger, Woody Guthrie, and The Weavers. Glover taught Ochs how to play guitar, and they debated politics. Ochs began writing newspaper articles, often on radical themes. When the student paper refused to publish some of his more radical articles, he started his own underground newspaper called The Word. His two main interests, politics and music, soon merged, and Ochs began writing topical political songs. Ochs and Glover formed a duet called “The Singing Socialists,” later renamed “The Sundowners,” but the duo broke up before their first professional performance and Glover went to New York City to become solo singer. Ochs started performing professionally at a local club called Farragher’s Back Room and was the opening act for a number of musicians in the summer of 1961, including the Smothers Brothers. Ochs continued at Ohio State into his senior year, but dropped out in his last quarter without graduating. Instead he followed Glover to New York. Ochs arrived in New York City in 1962 and began performing in numerous small nightclubs, eventually becoming an integral part of the Greenwich Village music scene. He emerged as an unpolished but passionate vocalist who wrote pointed songs about current events: war, civil rights, labor struggles and other topics. Ochs described himself as a “singing journalist” saying he built his songs from stories he read in Newsweek. By the summer of 1963 he was sufficiently well known in folk circles to be invited to sing at the Newport Folk Festival, where he performed “Too Many Martyrs” (co-written with Bob Gibson), “Talking Birmingham Jam”, and “Power and the Glory”—his patriotic Guthrie-esque anthem that brought the audience to its feet. Ochs’s return appearance at Newport in 1964, when he performed “Draft Dodger Rag” and other songs, was widely praised. But he was not invited to appear in 1965. Ochs deeply admired President John F. Kennedy, even though he disagreed with the president on issues such as the Bay of Pigs Invasion, the Cuban Missile Crisis, and the growing involvement of the United States in the Vietnamese civil war. When Kennedy was assassinated on November 22, 1963, Ochs told his wife that he thought he was going to die that night. In 1967, Ochs left Elektra for A&M Records and moved to Los Angeles. He recorded four studio albums for A&M: Pleasures of the Harbor (1967), Tape from California (1968), Rehearsals for Retirement (1969), and the ironically titled Greatest Hits (1970) (which actually consisted of all new material). For his A&M albums, Ochs moved away from simply produced solo acoustic guitar performances and experimented with ensemble and even orchestral instrumentation, “baroque-folk,” in the hopes of producing a pop-folk hybrid that would be a hit. 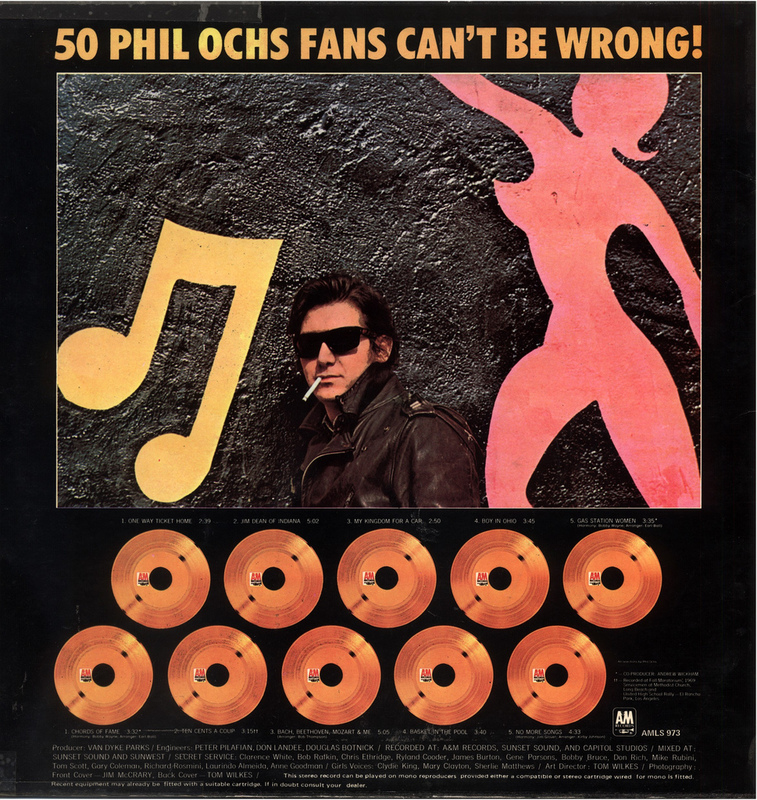 None of Ochs’s songs became hits, although “Outside of a Small Circle of Friends” received a good deal of airplay. It reached #119 on Billboard’s national “Hot Prospect” listing before being pulled from some radio stations because of its lyrics, which sarcastically suggested that “smoking marijuana is more fun than drinking beer.” It was the closest Ochs ever came to the Top 40. Joan Baez, however, did have a Top Ten hit in the U.K. in August 1965, reaching #8 with her cover of Ochs’s song “There but for Fortune” which was also nominated for a Grammy Award for “Best Folk Recording”. In the U.S. it peaked at #50 on the Billboard charts—a good showing, but not a hit. Here we have John Wayne, who was a major artistic and psychological figure on the American scene, … who at one point used to make movies of soldiers who had a certain validity, … a certain sense of honor [about] what the soldier was doing…. Even if it was a cavalry movie doing a historically dishonorable thing to the Indians, even as there was a feeling of what it meant to be a man, what it meant to have some sense of duty…. Now today we have the same actor making his new war movie in a war so hopelessly corrupt that, without seeing the movie, I’m sure it is perfectly safe to say that it will be an almost technically-robot-view of soldiery, just by definition of how the whole country has deteriorated. And I think it would make a very interesting double feature to show a good old Wayne movie like, say, She Wore a Yellow Ribbon with The Green Berets. Because that would make a very striking comment on what has happened to America in general. Ochs was involved in the creation of the Youth International Party, known as the Yippies, along with Jerry Rubin, Abbie Hoffman, Stew Albert, and Paul Krassner. At the same time, Ochs actively supported Eugene McCarthy’s more mainstream bid for the 1968 Democratic nomination for President, a position at odds with the more radical Yippie point of view. Still, Ochs helped plan the Yippies’ “Festival of Life” which was to take place at the 1968 Democratic National Convention along with demonstrations by other anti-war groups including the National Mobilization Committee to End the War in Vietnam. Despite warnings that there might be trouble, Ochs went to Chicago both as a guest of the McCarthy campaign and to participate in the demonstrations. He performed in Lincoln Park, Grant Park, and at the Chicago Coliseum, witnessed the violence perpetrated by the Chicago police against the protesters, and was himself arrested at one point. The events of 1968—the assassinations of Martin Luther King, Jr. and Robert F. Kennedy, the police riot in Chicago, and the election of Richard Nixon—left Ochs feeling disillusioned and depressed. The cover of his 1969 album Rehearsals for Retirement eerily portrays his tombstone. At the trial of the Chicago Seven in December 1969, Ochs testified for the defense. His testimony included his recitation of the lyrics to his song “I Ain’t Marching Anymore”. On his way out of the courthouse, Ochs sang the song for the press corps; to Ochs’s amusement, his singing was broadcast that evening by Walter Cronkite on the CBS Evening News. In August 1971, Ochs went to Chile, where Marxist Salvador Allende had been democratically elected in the 1970 election. There he met Chilean folksinger Víctor Jara, an Allende supporter, and the two became friends. In October, Ochs left Chile to visit Argentina. Later that month, after singing at a political rally in Uruguay, he and his American traveling companion David Ifshin were arrested and detained overnight. When the two returned to Argentina, they were arrested as they got off the plane. After a brief stay in an Argentine prison, Ochs and Ifshin were sent to Bolivia via a commercial airliner where authorities were to detain them. Ifshin had previously been warned by Argentine leftist friends that when the authorities sent dissidents to Bolivia, they would disappear forever. When the airliner arrived in Bolivia, the American captain of the Braniff International Airways aircraft allowed Ochs and Ifshin to stay on the aircraft, and barred Bolivian authorities from entering. The aircraft then flew to Peru where the two disembarked and they were not detained. Fearful that Peruvian authorities might arrest him, Ochs returned to the United States a few days later. Ochs was personally invited by John Lennon to sing at a large benefit at the University of Michigan in December 1971 on behalf of John Sinclair, an activist poet who had been arrested on minor drug charges and given a severe sentence. 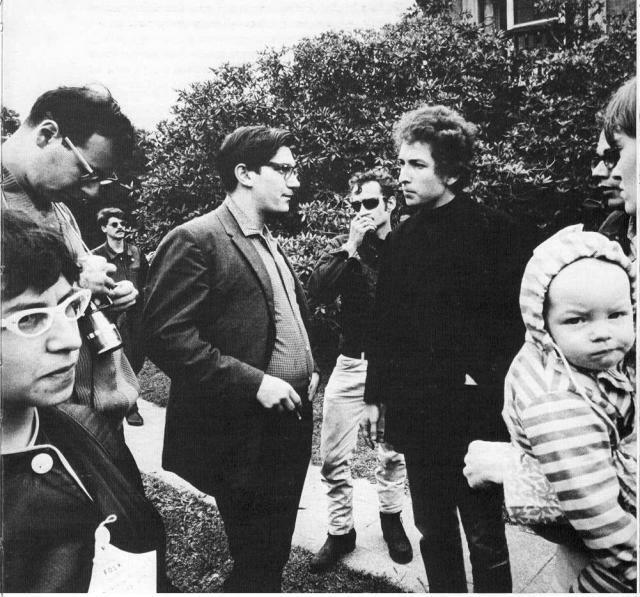 Ochs performed at the John Sinclair Freedom Rally along with Stevie Wonder, Allen Ginsberg, David Peel, Abbie Hoffman and many others. The rally culminated with Lennon and Yoko Ono, who were making their first public performance in the United States since the breakup of The Beatles. Ochs became increasingly erratic. In mid-1975, Ochs took on the identity of John Butler Train. He told people that Train had murdered Ochs, and that he, John Butler Train, had replaced him. Train was convinced that someone was trying to kill him, so he carried a weapon at all times: a hammer, a knife, or a lead pipe. Unable to pay his rent, he began living on the streets. After several months, the Train persona faded and Ochs returned, but he continued drinking heavily and talking of suicide. In January 1976, Ochs moved to Far Rockaway, New York, to live with his sister Sonny. He was lethargic; his only activities were watching television and playing cards with his nephews. Ochs saw a psychiatrist, who diagnosed his bipolar disorder. He was prescribed medication, and he told his sister he was taking it. 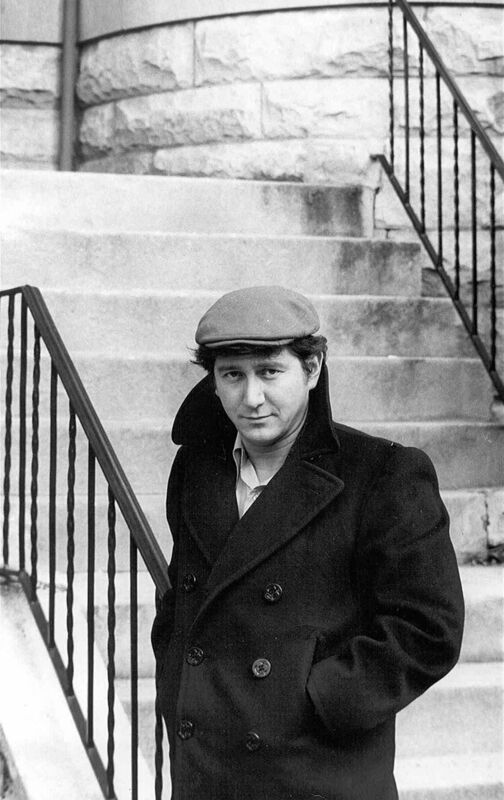 On April 9, 1976, Ochs committed suicide by hanging himself in his sister’s home. Years after his death, it was revealed that the FBI had a file of nearly 500 pages on Ochs. Much of the information in those files relates to his association with counterculture figures, protest organizers, musicians, and other people described by the FBI as “subversive.” The FBI was often sloppy in collecting information on Ochs: his name was frequently misspelled “Oakes” in their files, and they continued to consider him “potentially dangerous” after his death. While his tragic action was undoubtedly motivated by terrible personal despair, his death is a political as well as an artistic tragedy. I believe it is indicative of the despair many of the activists of the 1960s are experiencing as they perceive a government which continues the distortion of national priorities that is exemplified in the military budget we have before us. 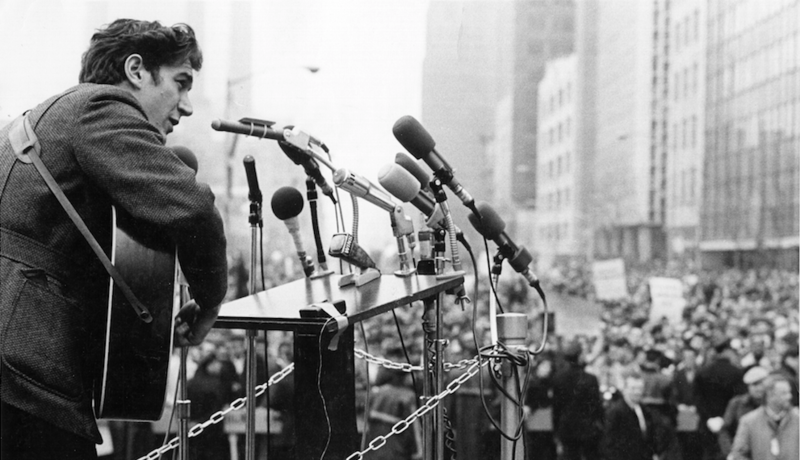 Phil Ochs’ poetic pronouncements were part of a larger effort to galvanize his generation into taking action to prevent war, racism, and poverty. He left us a legacy of important songs that continue to be relevant in 1976—even though “the war is over”. Just one year ago—during this week of the anniversary of the end of the Vietnam War—Phil recruited entertainers to appear at the “War is Over” celebration in Central Park, at which I spoke. It seems particularly appropriate that this week we should commemorate the contributions of this extraordinary young man. When I think of Ochs these days I think of the 60s. I think of his humanism, dedication, and faith along with his wit and sarcasm. In tribute I present this classic taste of the 1960s with my own hint of irony – Lipton Onion Soup dip. This was a perennial favorite at parties because it was easy to make and generally enjoyed – I guess. No need for more than the most rudimentary of recipes. You’ll need 1 envelope of Lipton® Recipe Secrets® Onion Soup Mix and 16 ounces of sour cream. Whip the two together and refrigerate for an hour or so. 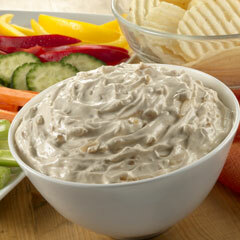 Serve with your favorite chips or raw vegetables.